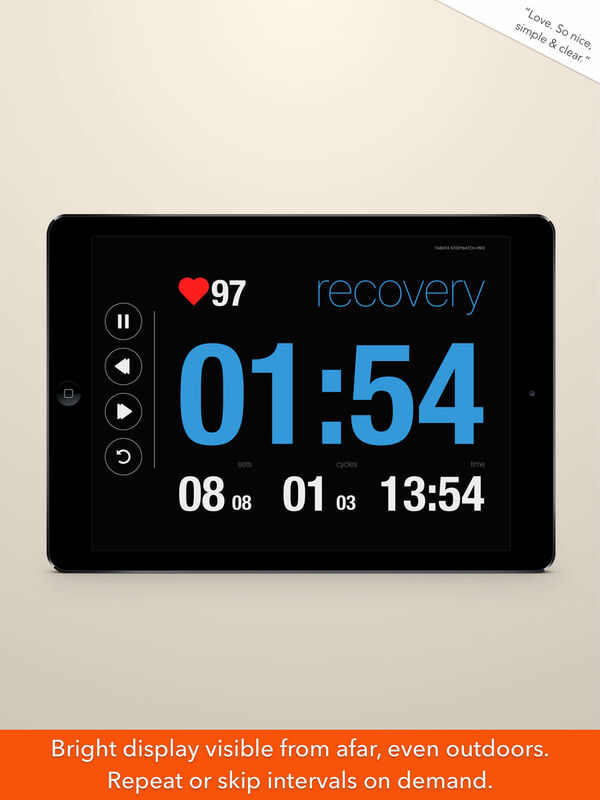 Tabata Stopwatch Pro is the ultimate Tabata Interval Timer that works for 'all' your interval training needs. You can use it with Tabata, HIIT, kettlebells, bodyweight exercises, interval running, sprints, etc. Some features of the app require a paid Pro Features In App Purchase. These include working in the background, no ads, access to announcement settings, the ability to use chest strap heart rate monitors and more sounds. 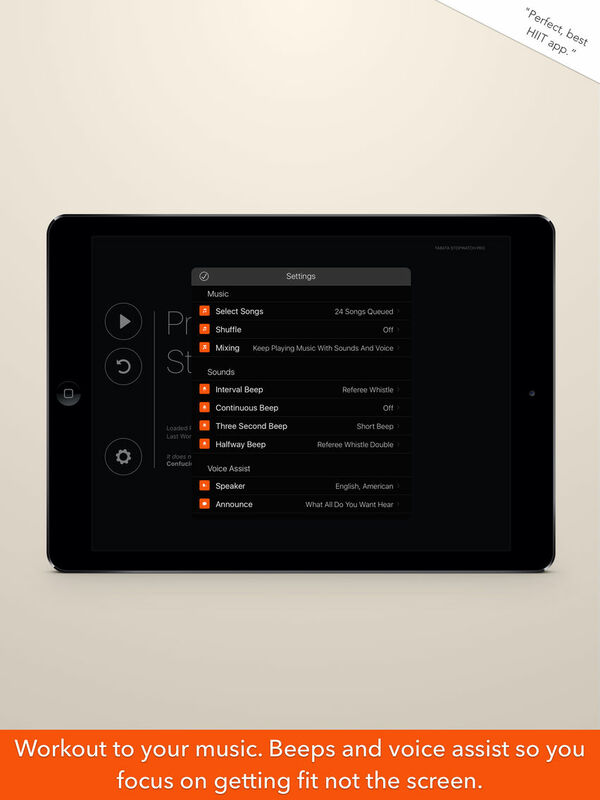 You can find out more about these by clicking on the GET PRO button in the app settings on the top right. Exercising can be extremely stressful for the body, please consult your doctor, trainer or coach before using this app. This app does not aim to teach, coach or guide you with fitness, exercises or working out. It is a utility for people (adults only) who already know what they are doing and why. Further, calculations for workout times, calories burned and heart rates when working out are only approximations and should not be used for any medical purposes. Version 2.1.5 cleans up a few things internally and removes a few unused settings. Version 2.1.4 cleans up a few things internally and removes a few unused settings. Version 2.1.3 has minor tweaks to a few icons and some small improvements. Version 2.1.2 improves support for iOS 12 and the new iPhones XS, XS Max and XR. It also adds back ads with consent. We have also fixed a few long standing nasties (bugs), sorry it took a while to track them down and fix. Version 2.1 adds support for iPhone X and cleans up a few things internally. More soon. Have awesome workouts and Stay HIIT. Version 2.0 has an all new font. The app has never looked better. We re-did some things, improved a few others for iOS 10 and the app looks fantastic. Everyone is going to ask you what you're using. That is a promise. Version 1.11 improves iOS 10 compatibility and fixes a few minor niggles. Have awesome workouts and Stay HIIT. Version 1.10 fixes a few minor bugs and issues with the app. We have improved announcement settings and you can now control what you want to hear more clearly. We have also improved what the app says and made it a little ‘lighter’. A few more internal improvements round up this update. Hello. This a big one. Ready? Version 1.9 adds support for iOS 9 and fixes a lot of the small glitches and problems that the new OS caused, it took a while because finding all of them was hard. We have made measures more consistent, the initial countdown interval may be set to zero or have it’s own settings like other intervals for example. 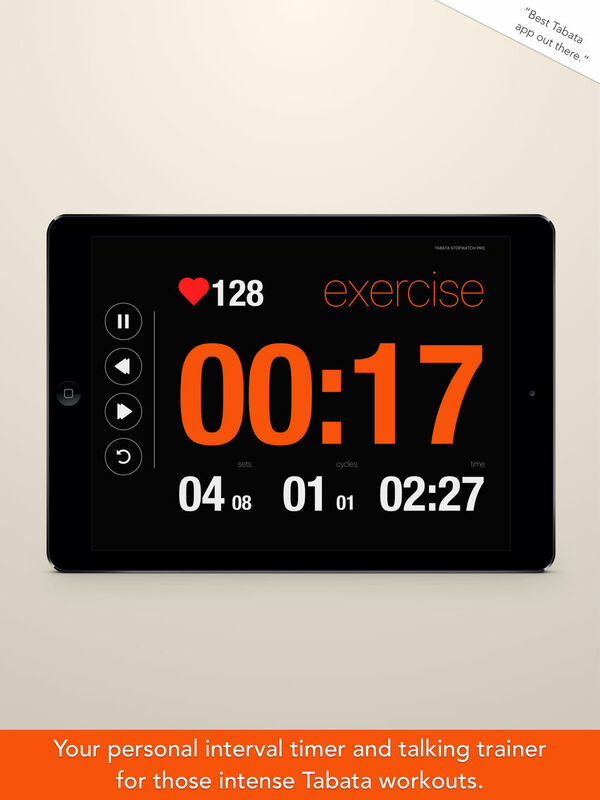 iPad people, the timer screen is all new and looks phenomenal when you’re looking at it from a distance when working out. Oh and you can rotate it to portrait for a simpler cleaner version. iPhone now supports all orientations. The landscape screens are simple and clean and work great when you’re looking at them from a distance or just using a big screen for a class in a gym. We have added support for bluetooth heart rate monitors (Pro users) and also Apple Health. 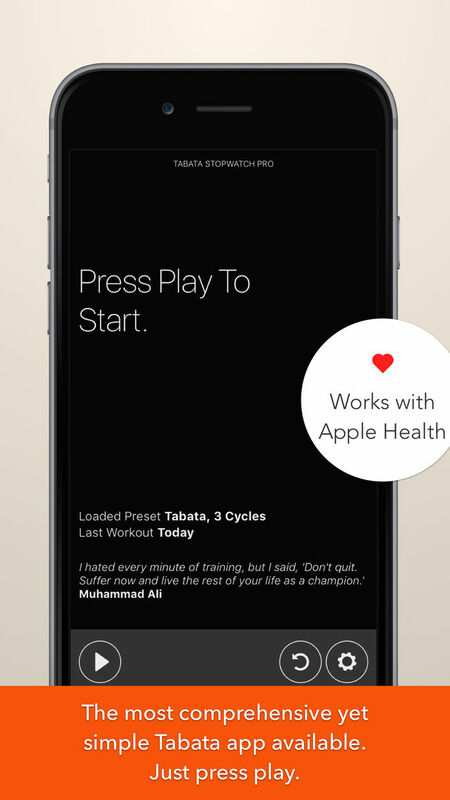 Apple Health in particular should allow you to track and monitor your progress and goals much better. We have added absolutely amazing new voice assist capabilities (Pro users). 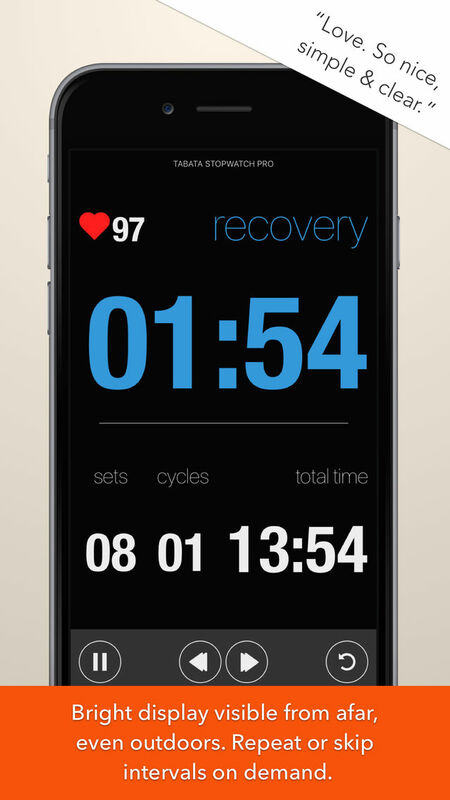 The app really comes alive and will literally talk you through your entire Tabata workout. Version 1.8 is a stability release that improves a few things and ties up a few loose ends. The "Bigger the better" release. 1. Support for iPhone 6 and 6 Plus. 3. Improved the home screen; now shows your current preset and some other niceties. 4. Added 10 new beeps including chimes, tinghsa, digital beeps and lasers (pro users). Do leave a review for this update if you have a minute. For any issues at all mail us at support (link in the app). There is no way for us to reply if you simply leave a comment on the App Store. The "Do you beep my interval" release. 1. You'll need iOS 8 to use the app. 2. Improved the settings design some more, including a new black theme. Try not to lick the screen. 3. You can now set upto 99 sets and 99 cycles (man you guys have some serious stamina, phew!). 4. You may now set different beeps for each interval. Need a separate beep for the recovery interval, no problem. 5. Added a new cooldown interval, group classes will love this for their post workout stretching. 6. Improved audio performance further. 7. Fixed a bug where the app would not work with the screen locked (pro users). 8. Fixed a crash when trying to buy the pro version. Don't forget to leave a rating for this update. The "A few small improvements" release. 1. Improved settings design. Simply beautiful now, like the rest of the app. Thank you for your ideas and support. Do write a review and help other people discover the app on the App Store. The "It just keeps getting better" release. Thank you for your ideas and support. Write a review about your experience with Tabata and help other people learn about and discover the app on the App Store. 1. 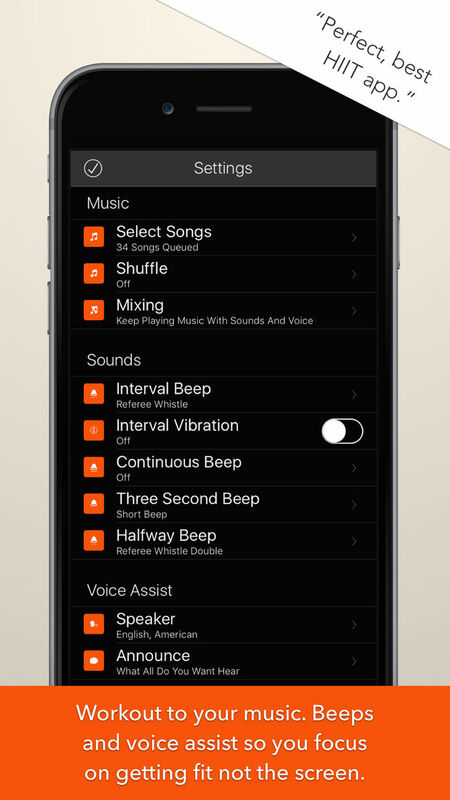 You can now optionally set a separate beep for your Rest interval. 2. You can now choose to have your timer displays count up or down. 3. Intervals may be now be between 0 seconds and 90 minutes long. 4. You can now jump across intervals when exercising. Go forward or backward to modify your workouts in real time. 5. Audio performance improvements and bug fixes. 6. 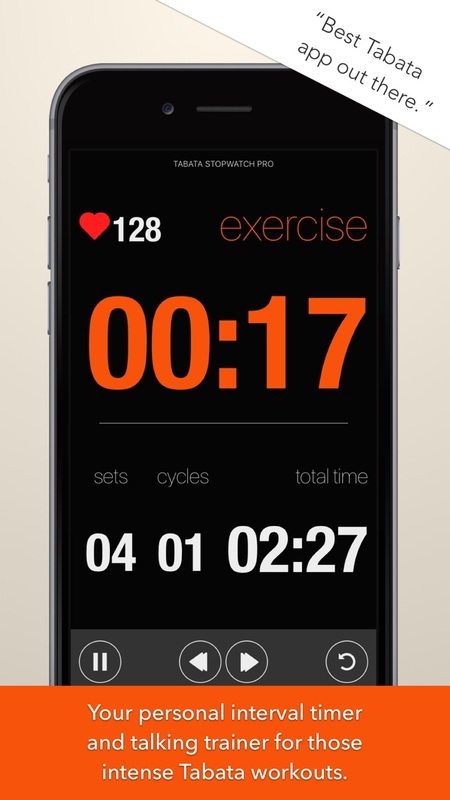 Improved iPhone workout display and UI. 7. 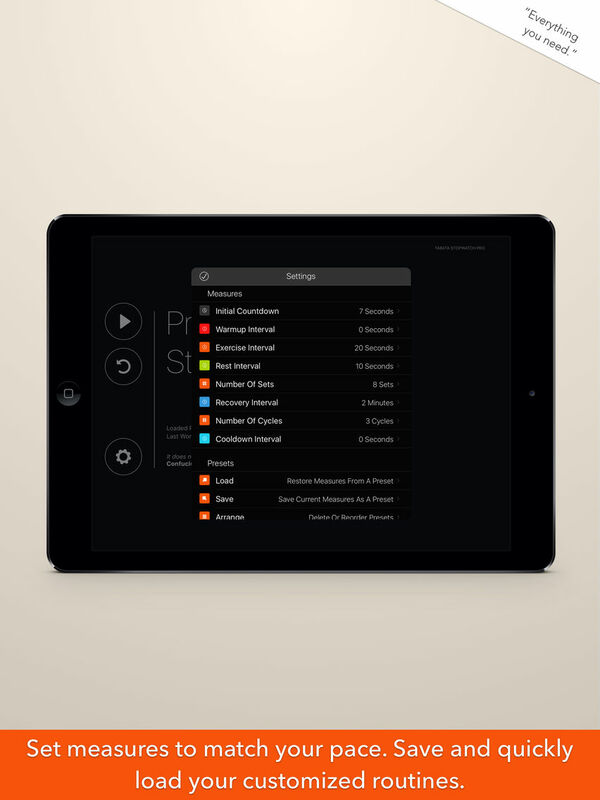 Minor improvements to the iPad display. 8. Improved and cleaner app settings. 2. Minimum supported version is now iOS 7. 3. 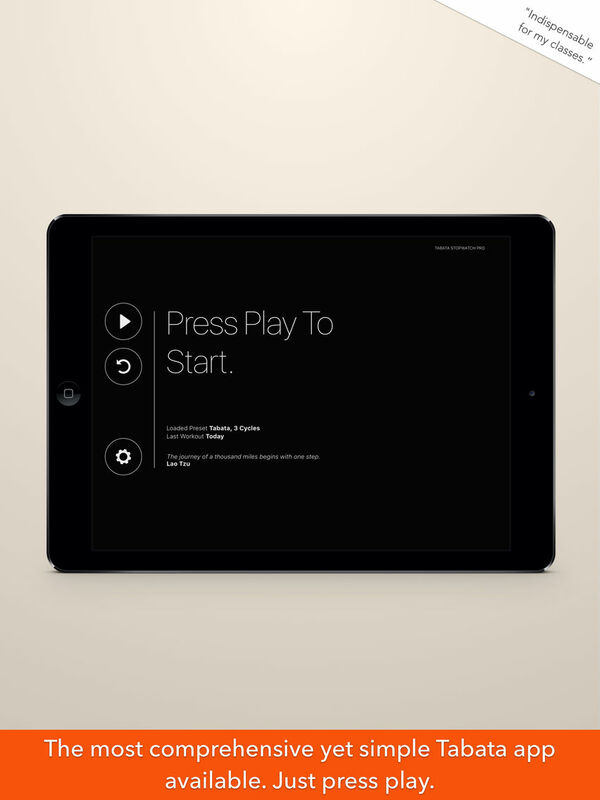 Completely new streamlined flat design. 4. Added a beautiful new white theme. 5. Voice assist quality and performance improvements. 6. Voice assist now supports localized english accents. 7. Completely new audio system to fix a few old problems and improve performance. 8. Enjoy your workouts with the screen locked or with other apps to play your favorite music (paid version only). 9. Added a post workout share option, you can now easily keep your friends updated about your workouts. Thank you for your support, we have lots more stuff coming soon. Do leave a rating if you have a minute (link in the App). 2. Added a halfway beep option. 3. Added music shuffle for songs or albums. 4. Added new sound beep options including buzzers, gongs, and horns. You might need to update your beep choices, sorry about that. 5. 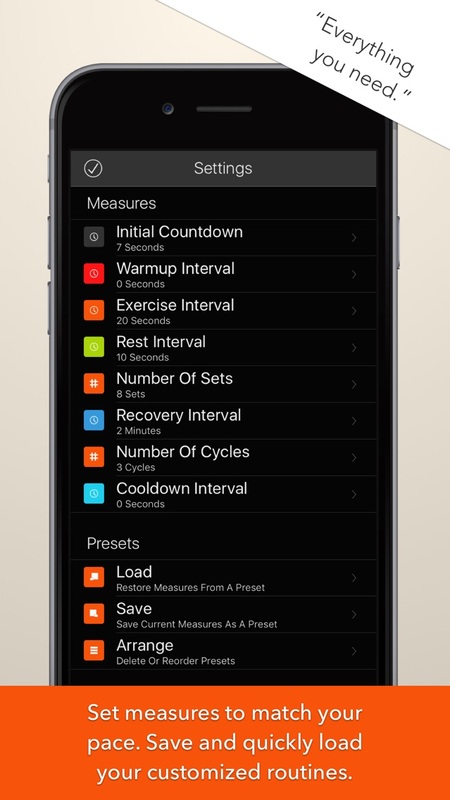 Added support for presets to quickly modify your workout routines (paid version only). Thank you for all your suggestions, app store ratings and support. 1. New and improved way to set intervals with great accuracy. 2. Beautiful new app icon. 3. All new clean app settings. We're listening, thank you for all your suggestions. Lots more coming soon. Carter Fitness Lab Others Fitness, Inc.